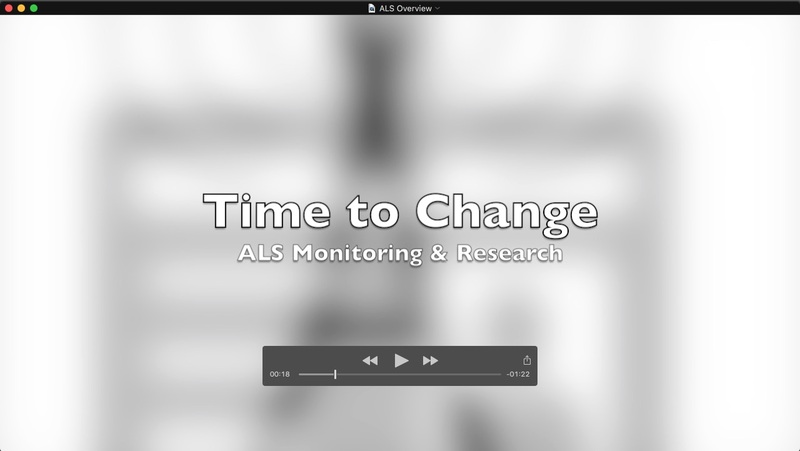 ALS / MND Patient Progression Research - monitor , track and contribute to research. Over 80+ key metrics of Motion, Range, Velocity, Dexterity, Fine Motor Skills, Voice , Respiratory, Supplements , Medications , Nutrition, Clinical Trials and other key Vitals. We are the forefront of PCOR. PCOR - "Patient Centered Outcomes Research" is the #1 movement leading the change in the entire medical field. MND ALS Patient progression research is about to join the new millennium of technology driven precision medical research. By leveraging mobile apps to capture telemetry , biometrics and expanding on developments based on personal tracking fitness and health. Watch this 2min video about how together we will change research forever ! Become iNVOLED get eNGAGED - BigData / Research / Analytics. Whether your a pALS , cALS and everyone who loves or lost someone due to ALS / MND. Our Research involves EVERYONE. Sign-up to join this global research project ! MND can be classified into four main types depending on the pattern of motor neurone involvement and where the symptoms begin. Your donations to the MND - ALS Patient progression project will ensure that "Every patients journey is different" and "Only time will tell" will become sayings of the past. We need everyone not just pALS so there is valuable comparisons between patients and people not affected by ALS / MND. Solid research is based on the simple principal that a control group is involved to compare and contrast findings against. This allows for the development of a set of baseline readings and measurements to track outcomes against. To accomplish this goal we urge EVERYONE who loves a pALS, or lost a warrior please join us. Don't wait another 90mins. Every 90mins someone will die from ALS / MND. Every 90mins a loved one is diagnosed. Click donate or join the research using these links or in the top right menu. 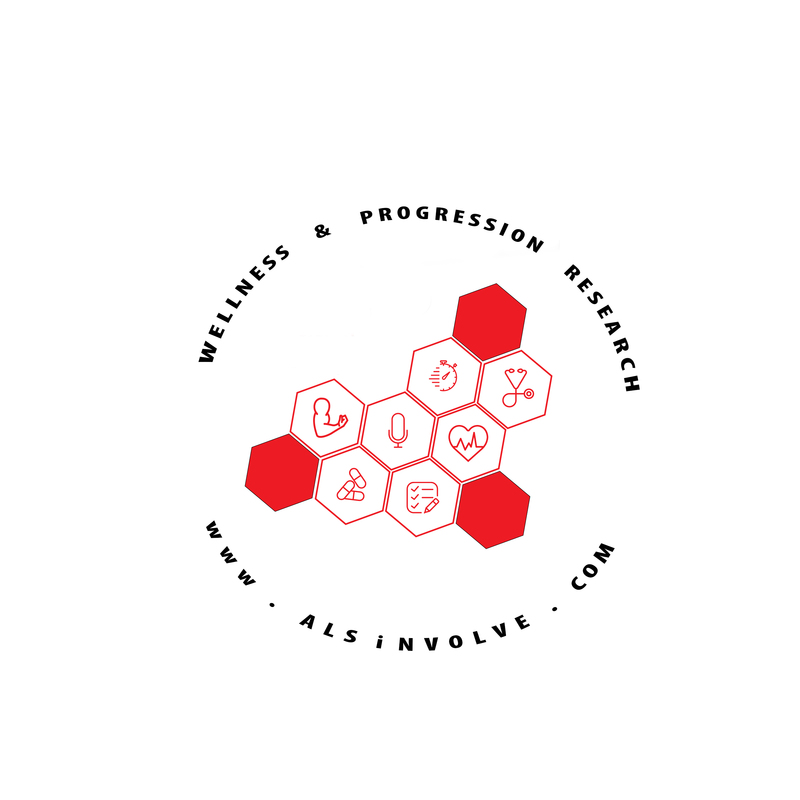 The ALS iNVOLVE App is a research gathering solution for both individuals with ALS/MND "patients" and also non-affected individuals who wish to contribute to the research process "control group". All personal information will be "de-identified" and a unique encrypted GUID "global unique identifier" will be assigned to all research data. All data transfer from the app to the research repository shall take place over an encrypted network connection. All submitted data shall remain in the research repository for an unlimited length of time. If you should choose to stop participating in the research project, the app shall be disabled and no new data will be collected from that point in time, however all prior data as agreed to within the terms and conditions of the informed consent survey terms shall remain within the research repository indefinitely. The ALS Never Surrender foundation and any/all of its affiliated research partners shall take reasonable steps to insure the integrity of the research data and use it to further global ALS / MND research projects to help find causes, treatments and cures for ALS / MND. ALS Never Surrender Foundation (“ALS NeverSurrender, “we,” or “us” or "the foundation") is a 501(c)(3) nonprofit ALS/MND research foundation in the United States, created to change how researchers approach measurement and tracking progression and the complexity of human telemetry and biometric information and other potential supplement approaches in the research , treatment and potential cure development for ALS/MND. 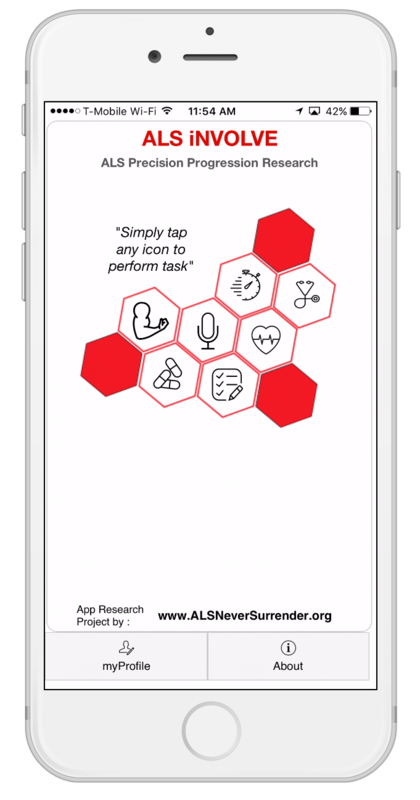 We have developed the 1st 360 view mobile application (the “ALS iNVOLVE App" and "ALS eNGAGE App” herein referred to as the "ALS App") to facilitate the gathering of ALS Progression research via this study (the “Study”). The Study is designed to help our research partners understand variations in symptoms of ALS / MND disease. The Study and the ALS App are designed for users over 18 years of age, and are open for use or participation by anyone, whether or not he or she has ALS/MND disease. Registering for the Study through the foundation. In order to access the ALS App functionalities, we ask you to create an account through the ALS App. To create an account, you must provide a username, a password and your email address. We will also collect 4 pieces of personal data purely for the purpose of generating an encryption Global Unique Identifier (the "GUID") this includes first name , last name , date of birth , place of birth. We will inform you of the purposes for which we are collecting, processing, using, and sharing your personal data and we will obtain your consent through an informed consent document and process. You must affirmatively consent to participate in the Study prior to creating your account. To provide your informed consent. Data Imports. 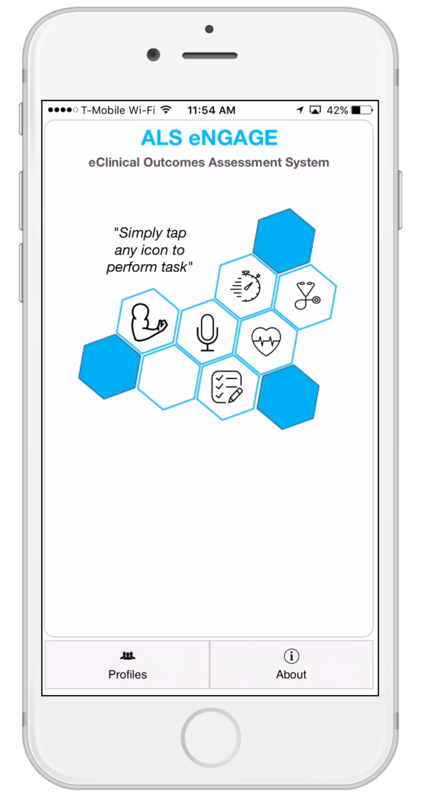 The ALS App allows you to import data to the ALS App and the Study, including voice recordings and data collected in connection with your performance of specified tasks while holding your iPhone like walking and tapping or through sensors on your iPhone. You may also give permission to import certain data from third party wearable activity devices (like Fitbit or Jawbone), as well as other data that you may have provided to Apple Health app separately or that may be available through other third party applications and data available through the Apple Health app, such as birthdate, weight, height, steps walked or sleep pattern. We are not responsible for the data practices of third parties from which you may elect to import data and you are advised to consult their privacy policies separately. You may choose not to import these data types and to still participate in the Study. Health Surveys and Health Vitals. With your permission, we collect and process some personal data that is necessary for the purpose of the study. To better understand your evolving health, we will ask you to answer questions about yourself (e.g., body height, weight, gender, age, blood pressure, pulse , pulseOX%, and a number of respiratory measurements), your medical vitals & history, and your current health. Some surveys are optional. The ALS FRS-R , diagnosis and medications survey is mandatory. It is used to appropriately administer activities to participants with or without ALS/MND disease. Standard Log Information. We automatically collect standard server log information, such as internet protocol address and details of how you used the ALS App (e.g. history of page requests such as uploading data or signing in and date/time of request). Location data. You may elect to turn on the location services on the mPower App and grant the app access to your GPS coordinates. With your permission, we use that location data to determine the overall distances you travelled so that we better understand your level of activity and evolving health, but we do not share your actual location. De-identification of personal information. We will de-identify all information and it will only be connected and tracked via the encrypted GUID before it becomes available via the global research repository. We use your contact information, including email address, to contact you for administrative purposes regarding your participation in the Study and your use of the ALS App. We use the information that we collect through the ALS App and the Study to operate, maintain, enhance and provide all features of the ALS App and the Study, to provide services and information that you request, to respond to comments and questions and otherwise to provide support to users. Your data will be used for improving general health, medical and fitness management and for the purposes of medical research. Your data will NOT be used for advertising or other use-based data mining purposes. We will not access your personal contacts, other applications, personal photos nor text and email messages on your iPhone. Even if you use choose to use the Apple fingerprint technology to access the ALS app via stored passwords / user account authentication, we DO NOT access , track , save , or in any manner within the ALS app or the Study use this fingerprint data. We also reserve the right to disclose your information that we believe, in good faith, is appropriate or necessary to (i) take precautions against liability, (ii) protect ourselves or others from fraudulent, abusive, or unlawful uses or activity, (iii) investigate and defend ourselves against any third-party claims or allegations, (iv) protect the security or integrity of the ALS App and the Study and any facilities or equipment used to make the ALS App or Study available, or (v) protect our property or other legal rights (including, but not limited to, enforcement of our agreements), or the rights, property, or safety of others. We will notify you of any such disclosures. As described above in the “How We Use Information” section, we will combine your Study data, including survey response and tasks measurements, with those of other Study participants. The combined data will be transferred to the Research Data Repository, and our associated computational research platform partners such as AuralAnalytics and Origent Data Sciences , for analysis. Researchers from the Study teams and its partners accessing data through the Research Repository will analyze the data and report findings back through blog or scientific publications. This Study gives you the option to share your coded Study data more broadly, with other researchers worldwide, for use in this research and beyond to benefit future scientific research. If you choose to share your data broadly, your coded data (without your contact information) will be added to a shared Study dataset on the Research Repository and will be made available to qualified researchers who are registered users such as those members of the NEALS ALS Consortium or members of the CDC ALS Research repository and who agree to using the data in an ethical manner, to do no harm and not attempt to re-identify or re-contact you. We do not track our ALS App visitors over time and across third party websites or online services to provide targeted advertising, and we do not specifically respond to Do Not Track (“DNT”) signals. The foundation uses appropriate physical, managerial, and technical safeguards that are designed to protect the confidentiality, integrity and security of personal data that we collect and maintain against accidental or unlawful loss, theft and misuse and unauthorized access, disclosure, alteration destruction, or any other type of unlawful processing. We cannot, however, fully guarantee the security of personal data or other information transmitted to us through the ALS App or the Study. Your Rights and Choices Subject to applicable law, you may have certain rights regarding the personal data we maintain about you. You may have the right to request access to and receive information about the personal data we maintain about you, or have your personal data rectified, blocked or deleted if it is incorrect, inaccurate or outdated. Following your request, we will accommodate your enquiry as required by applicable law. Within the App, you are able to review and amend certain personal data we have collected through your use of the ALS App and participation in the Study. If you wish to access, rectify, delete or block any other personal data we hold about you, you may contact us at privacy@alsneversurrender.org. Please note that while any changes you make will be reflected in active user databases within a reasonable period of time, we may retain all information you submit for backups, archiving, prevention of fraud and abuse, analytics, satisfaction of legal obligations, or where we otherwise reasonably believe that we have a legitimate reason to do so, as permitted by applicable law. At any time, you can elect not to grant access to the use of location data by de-activating the relevant setting within the ALS App or your mobile device. If you would like to withdraw from the Study, you may do so within the ALS App by clicking on the “Leave study” link in the About page. You also may contact us at privacy@alsneversurrender.org to withdraw from the Study. You can withdraw any consent you have provided to us for the processing of your personal data at any time and free of charge. Please note that if you withdraw from the Study, we will stop collecting new data from you, but the coded study data that you have already provided will already have been distributed and will not be able to be destroyed or deleted. If you have questions about your rights and choices in relation to your personal data, or would like to request additional information, please contact privacy@alsneversurrender.org. Although you may access the ALS App or participate in the study from a location outside of the United States, any personal data collected by us in connection with the ALS App or the study may be transferred to, processed, and stored within the United States. Also, we may transfer your data from the United States to other countries or regions in connection with storage and processing of data, fulfilling your requests, and operating the ALS App and the Study. By using the ALS App or participating in the Study, you will be asked to consent to the transfer of your personal data, including your health information and location data, to countries outside of your country of residence, including to the United States. Version 1.0 - Effective 2016 Dec, 10th - Original version.